This is a cute activity that will help students get to know one another and you, as the teacher, will learn about all students. The great thing is, they will be doing all the work! Place the cards in a bag or container and have students pair up. Give each pair a "Bag of Questions". There is a decorative label for the bag included in this packet.They will pick out a question from the bag to ask their partner. Then their partner will pick a question from the bag to ask them. This continues until all questions are gone or until time is up. Students will then return to their seats and write down what they learned about their "new friend" using sentences and pictures. They will present their writings to the class so every one can hear. 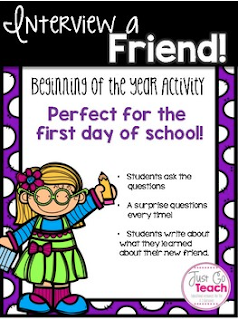 This is also a great activity to use when you have new students enter your room throughout the year.